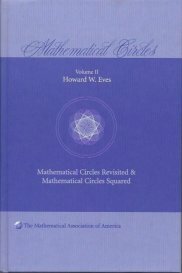 Mathematical Circles es una colección que originalmente fue publicada en seis volúmenes en los que Howard Eves recoge 1800 historias, anecdotas y curiosidades que recorren toda la historia de las matemáticas. Para disfrutar de la mayor parte de ellas no se necesitan conocimientos matemáticos específicos. 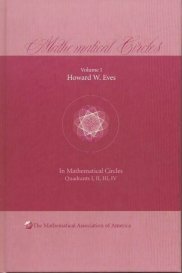 Howard Eves(1911-2004) fue un geométra e historiador de las matemáticas americano autor de muchos artículos y libros entre los que se incluye Introduction to the History of Mathematics uno de los libros de textos más usados en la materia. En la edición que aquí se reseña los seis volúmenes originales se agrupan en tres. The Animal World, Real and Imaginary; Primitive Man; Pre-Hellenic Mathematics; A Few Later Chinese Stories; Thales; Pythagoras; The Pythagorean Brotherhood; Pythagoreanism; Plato; Euclid; Archimedes; Eratosthenes and Appolonius; Diophantus; The End of the Greek Period. Some Minor Stories About Some Minor Men; Pre-Newtonian Versus Post-Newtonian Mathematics; Isaac Newton and Gottfried Wilhelm Leibniz; The Bernoullis; The Small Initial Understanding of the Calculus; Bonaventura Cavalieri, Yoshida Koyu and Seri Kowa; Some Lesser Seventh- and Eighteenth-Century British Mathematicians; Some lesser Seventeenth-and Eighteenth Century Continental Mathematicians; Leonhard Euler; Lagrange; Laplace; Napoleon Bonaparte. Abel and Agnesi; Charles Babbage; Caryle and Legendre; Mathematicians and Nature Lovers; Clifford and Dodgson; Calculating Prodigies; Augustus de Morgan; Albert Einstein; Carl Friedrich Gauss; Some Little Men; Hamilton and Hardy; The Miscellaneous Stories; J. J. Sylvester and Norbert Wiener. Contents: Numbers and Numerals; Big Numbers; Pi; Gematria; Counting Boards; Tally Sticks; Computers; Weights and Measures; Symbols and Terminology; Arithmetic and Algebra; Geometry; Trigonometry; Probability and Statistics; Logic; Topology; From the Younger Set; Classroom Tactics and Antics; Mathematicians and Mathematics; Women of Mathematics; Wherein the Author is Involved; Nicolas Bourbaki; Archimedes to Sidney Cabin; Cauchy to Coolidge Dedekind to Gerbert; Hamilton and Hardy; Heilbronn to Hurwitz; Kasner to Lawrence; Miller to Newton; Peano to Swift; Sylvester to Whitehead; Norbert Weiner. 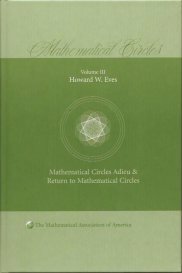 EVES, Howard W. Mathematical Circles Adieu and Return to Mathematical Circles. The Mathematical Association of America. 2003. 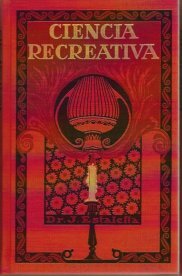 404 p. ISBN: 978-0-88385-544-7. Mathematics in Early America; Pierre de Fermat and René Descartes; Some Pre-Nineteenth Century Mathematicians; Carl Friedrich Gauss; Schellbach and Grassmann; Seven Mathematicians and a Poet; Charles Hermite; Lewis Carroll; A Melange: Albert Einstein; L. J. Mordell; From Our Own Times, On Mathematics and Mathematicians; Professors Teachers and Students; Lectures; Authors and Books; Definitions; Logic; On Mathematics and Logic; Counting; Numbers; Logarithms; Arithmetic; Computers; Mnemonics; The Number Thirteen; Mersenne Numbers; Business Mathematics; Probability and Statistics, Algebra; Geometry; Recreational Matters; Geometrical Illusions. Concerning Some Men of Mathematics; Albert Einstein; Einstein’s Theory of Relativity; Einstein and Children; Einstein’s Humor; Einstein Quotes and Comments; Lobachevski and János Bolyai; Julian Lowell Coolidge; Some More Stories about Men of Mathematics; Some Literary Snips and Bits; Sherlockiana; Poetry, Rhymes and Jingles; Computers and Calculators; Algebra; Geometry; Numbers; Probability and Statistics; Flawed Problems; Recreation Corner; Have you Heard? ; Mr. Palindrome; Examples of Recreational Mathematics by the Master (Charles W. Trigg); Miscellanea. Epilogue: Some Mathematical Humor in Minute Doses; Some Bits and Tips on Teaching Mathematics; Some Logical and Some Illogical Moments.